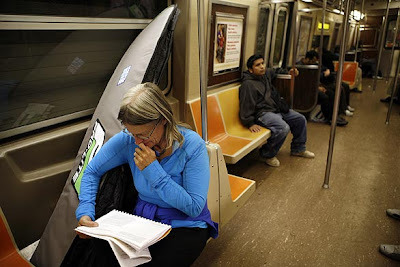 New York City's Transit Authority welcomes surfers on the subway while LA's Metro Rail management works to limit cyclists from the rail system. One large city embraces people and their "stuff" while LA looks squarely at cyclists and their gap-closing transportation solutions and says "you are a congestion problem." Steve Lopez of the LA Times tells a story of an old LA surfing buddy who now lives in New York City and still manages to catch a wave or two, rising early to catch the A Train in Harlem and carrying a 7' surfboard all the way to Roackaway Beach in Queens. Somehow she is able to navigate the NYC subway system without the support of the NY Surfers' Advisory Committee or any other transit activists, she simply rides the subway and it all works out. (3) A unified plan to ensure that our rail operations are as safe as possible for all users, including a specific bike-on-rail policy. The odd thing about this directive is that is didn't instruct the staff to consult with the Metro's own Bikeways division. Does the Metro know that it has a Bikeways Division? The Board, after some prodding from the public, modified the instruction to gather input so that it included, among others, the cycling community! September 30, 2009 has come and gone. I made sure to let Mr. Cannell know that I would like to be included in the "cycling community" input process. Since then I've heard nothing. "Unfortunately, after much searching, Records Management has no documents to provide on this matter since the relevant Metro personnel have not yet received all the information to make an informed decision. Therefore, we will close your request at this point. You may contact me at (213) 922-4880 or lord@metro.net if you have any questions or comments." 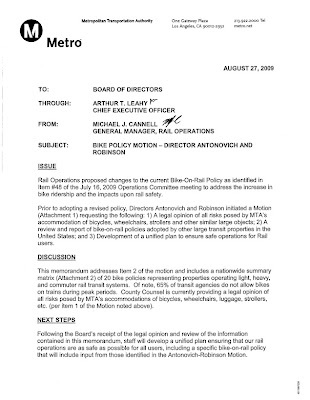 About the same time that the Records Management department says there is nothing to look at, I'm reading a report that Mr. Cannell submitted quietly to the Metro's CEO and the Metro Board, way back on August 27th, 2009. I'm not sure how this "non-report" qualifies as the fulfillment of the Board instruction or how this would qualify as "gathering input from the cycling community" but it is apparent that it was done so quietly that even the Metro's Records Management department was unaware of the action. Ultimately, all snubs and fumbles and RPA failures and misunderstandings aside, it's a sad day when a surfer in Harlem gets more respect from the local transit authority than a cyclist in Los Angeles who simply wants to close those service gaps and get to work on time or home to the family. It's time for the Metro to form a Metro Bicycle Advisory Committee and it's time for the Metro to embrace cyclists as transportation solutions. "See you on the Metro!" When I was in Chicago last, the CTA also had a 2 bike per car rule. So I think the better comparison would be between an established agency with a bike maximum rule and the LACMTA which hasn't in reality established any real rule yet rather than NYCMTA. How many surfboards does Chicago allow? Back to LA, we already have a bike limitation rule here in LA, Cyclists are forbidden from bringing their bikes on Rail within the City Center during peak hours. The proposal is to replace this bad rule with another bad rule. Meanwhile, no mention is made of shopping carts, luggage, baby strollers, surfboards, kayaks, large bags of recyclables, and other "stuff." The big difference here is that bicycles are a gap closing transportation solution. Even the fancy suitcases with the larger wheels won't get you home when the 96 stops running but a bike will. You should post a link to the place to comment to the MTA. I feel that LA does not have the luxury of limiting types of mobility. We have such a car-centric mentality here seemingly out of lack of other options, so making bicycling mobility more difficult is not a good idea until we can sufficiently provide other non-vehicular means of transportation. they're pretty funny people. i like their straight-forward wording. Seattle's Link Light Rail allows four per car, two on bike hooks and two standing. "It's time for the Metro to form a Metro Bicycle Advisory Committee and it's time for the Metro to embrace cyclists as transportation solutions." - That's a natural. Bicycles just extend and give flexibility to transit riders. I live in Hollywood and just got a job transfer from Downtown LA to Seal Beach. I used to take the subway to Downtown from Hollywood without a bike. Now I would like to take the subway from Hollywood to Union Station and then grab the Red Line to Long Beach which is about 5 miles from my work site. Having the ability to take a bike on both the subway and Red Line would greatly help me since I would rather ride a bike from Long Beach to my final destination at Seal Beach which is about 5 miles. The bike would save me time. But I am worried about a scenario where there is enough room on the first route from Hollywood to Union Station, but then I get kicked off at Union Station (because the car is full), I would be stuck at Union Station. My other thought would be to use a fold up bicycle. I wonder it MTA has size restrictions for those carrying a fold-up bike. There are different size fold up bikes. Any thoughts or experiences with fold-up bikes on MTA subways/rails? The Metro says that there is no limit or restriction on foldies. So you should have no problems. The other option for you is to keep a bike at the BikeStation in Long Beach which is next to the rail line and then it will always be there for you. The MTA Records Department is a joke. Their goal is not to prevent the release of public records, not to actually track them down. I have a good template that you're more than welcome to use. Thanks for the suggestion of bike station.